Write a C program to create a circular linked list of n nodes and traverse the list. How to create a circular linked list of n nodes and display all elements of the list in C. Algorithm to create and traverse a Circular linked list. The creation steps of a circular linked list is almost similar as of singly linked list. Circular linked list only differs only differs in the last stage of its creation as of singly linked list. Follow these steps to create a circular linked list. Create a head node and assign some data to its data field. Make sure that the next pointer field of head node should point to NULL. Now head node has been created that points to the first node of the list. Lets take another pointer that also points to the first node say prevNode pointer. Create a newNode and assign some more value to its data field and also do sure that next pointer field of newNode should point to NULL. Now connect the previous node with newly created node i.e. 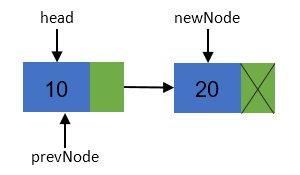 connect the next pointer field of prevNode with the newNode. So that next pointer field of prevNode points to newNode. Move the prevNode ahead i.e. 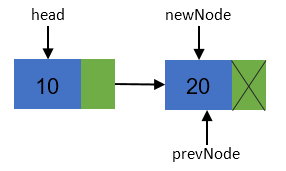 prevNode should point to newNode which can be done as prevNode = prevNode.next. 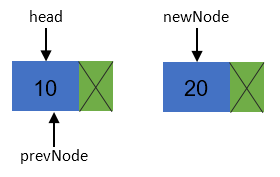 Repeat step 4-6 till N (where N is the total number of nodes to be created). After all nodes have been created. Now at final stage we have to connect the last node with the first node in order to make it circular. Therefore, now connect the next pointer field of prevNode with the head node i.e. prevNode.next = head (Since prevNode points to last node of the list) and you are done. * Creates a circular linked list of n nodes.